C:N value is one of the primary indications of the degree of preservation of bone protein (collagen) and/or contamination by soil organic substances. According to van Klinken (1999, 691), the characteristic %C values of intact collagens are 34.8±8.8 (1σ) wt %C; the nitrogen content of intact collagen is between 11 and 16 wt %. The recommended values for C:N atomic values are between 2.9 – 3.5 (calculated by dividing the percent of carbon by the percent of nitrogen in the bone and multiplying the number by 14/12, due to the different atomic weight of these elements). Sometimes excess salts remaining in the collagen after extraction make %C appear lower, however, this should not change the isotopic composition of the collagen. Higher values of %C may indicate the contamination from soil organic carbon. If C:N ratios are higher than 3.5 then the δ13C may point to the source of excess carbon, i.e contamination from humic acids in the soil will tend to produce more negative values (less than -24‰). Carbon (δ13C) stable isotope analysis is used to estimate the proportions of so called C3 (most plants) versus C4 plants (maize, cane sugar, certain millets, chenopods, sorghums and amaranths) and to distinguish between the consumption of marine versus terrestrial organisms in an individual’s diet. C3 plants have δ13C values averaging about -26.5‰, while values for C4 species average about -12.5‰. The bone collagen from herbivores that subsist only on C3 grasses will give a value for δ13C of ca. -21.5‰. If the diet were based only on C4 grasses then the value would be ca. -7.5‰. If a modern individual consumes both C3 and C4 species, the δ13C value for its collagen will lie somewhere between -21.5 and -7.5‰. The δ13C values of marine plants usually lie in an intermediate position between the values of terrestrial C3 and C4 plants, depending on their carbon sources. 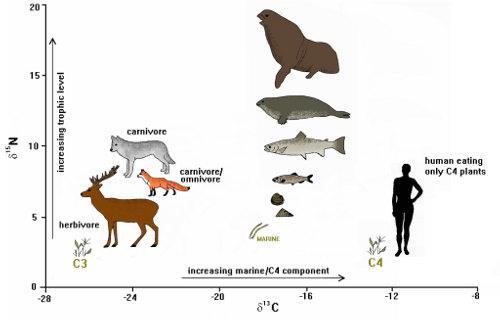 Therefore, marine fauna usually have carbon isotopic values that are less negative than those of terrestrial animals feeding on C3-based foods and more negative than those feeding on C4-based foods. Freshwater aquatic foodwebs appear to have C3-like carbon isotopic compositions. A small (approximately 0.5-2‰) enrichment for carbon isotopic values occurs in each step of a foodchain. For example, if the δ13C value of bone collagen of a herbivore subsisting on C3 plants provides a value of ca. -21.5‰, then the collagen of a human consuming the meat of that herbivore will give a δ13C value of ca. -20.5‰. The nitrogen stable isotope (δ15N) analysis identifies the trophic level of an individual. The consumer collagen usually displays δ15N ratios, which are about 3-5‰ greater than its diet. This fractionation effect results in a ca. 3-5% increase in δ15N as an individual ascends each step of a foodchain. For example, the δ15N values of most modern plants are between 0 and 5‰. Therefore, the nitrogen isotopic values of populations that rely on terrestrial animal protein in their diet, would average from around 9‰. The nitrogen levels of a consumer will increase when relying more heavily on aquatic resources. The mixture of both terrestrial and marine (fish and mammals) food resources in the diet would typically reveal δ15N ratios of around 10‰; the highest δ15N ratios are usually expected from populations using aquatic sources as a main staple in the diet, because the foodchains in aquatic ecosystems are more extended than those of terrestrial ones. It should be noted that a number of non-dietary factors may influence the carbon and nitrogen isotopic ratios of individuals. These include climatic and canopy effects for δ13C ratios and climatic, physiological, crop manuring and nursing effects for δ15N ratios. For more detailed information see http://en.wikipedia.org/wiki/Isotope_analysis. Fig. 1. Simplified summary of stable carbon and nitrogen values for terrestrial and marine ecosystems (values are for flesh; to convert to bone collagen values, 5‰ should be added to δ13C values; δ15N values are the same for flesh and bone). Adapted from Schulting 1998. Fig. 2. 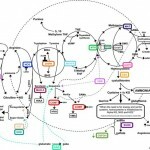 Examples of various human diets (after Schoeninger et al. 1983; Pollard 1993). Ambrose, S. H., 1993: “Isotopic Analysis of Palaeodiets: Methodological and Interpretive Considerations”. In: M. K. Sandford (ed. ), Investigations of Ancient Human Tissue: Chemical Analysis in Anthropology, USA: Gordon and Breach Science Publishers, 59-130. Ambrose, S. H., B. M. Butler, D. B. Hanson, R. L. Hunter-Anderson and H. W. Kruegers, 1997: “Stable Isotopic Analysis of Human Diet in the Marianas Archipelago, Western Pacific”, American Journal of Physical Anthropology104, 343-361. Bocherens, H. and D. Drucker, 2003: “Trophic Level Isotopic Enrichment of Carbon and Nitrogen in Bone Collagen: Case Studies from Recent and Ancient Terrestrial Ecosystems”, International Journal of Osteoarchaeology 13, 46-53. Chisholm, B. S., 1989: “Variation in Diet Reconstructions Based on Stable Carbon Isotopic Evidence”. In: T. D. Price (ed. ), The Chemistry of Prehistoric Human Bone, Cambridge: Cambridge University Press, 10-37. DeNiro, M. J. and C. A. Hastorf, 1985: “Alteration of 15N/14N and 13C/12C Ratios of Plant Matter during the Initial Stages of Diagenesis: Studies Utilising archaeological Specimen from Peru”, Geochimica et Cosmochimica Acta29, 97-115. Dufour, E., H. Bocherens and A. Mariotti, 1999: “Palaeodietary Implications of Isotopic Variability in Eurasian Lacustrine Fish”, Journal of Archaeological Science 26, 617-627. Hedges, R. E. M. and L. M. Reynard, 2007: “Nitrogen Isotopes and the Trophic Level of Humans in Archaeology”, Journal of Archaeological Science 34, 1240-1251. Kuzmin, Ya. V., M. P. Richards and M. Yoneda, 2002: “Palaeodietary Patterning and Radiocarbon Dating of Neolithic Populations in the Primorye Province, Russian Far East”, Ancient Biomolecules 4(2), 53-58. Pollard, M., 1993: “Tales Told by Dry Bones”, Chemistry and Industry, 359-362. Ramsey, C. B., T. Higham, A. Bowles and R. Hedges, 2004: “Improvements to the pretreatment of bone at Oxford”, Radiocarbon 46(1), 155-163. Schoeninger, M. J. and M. J. DeNiro, 1984: “Nitrogen and Carbon Isotopic Composition of Bone Collagen from Marine and Terrestrial Animals”, Geochimica et Cosmochimica Acta 48, 625-639. 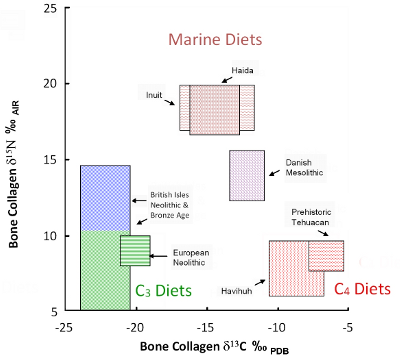 Schoeninger, M. J., M. J. DeNiro and H.Tauber, 1983: “15N/14N Ratios of Bone Collagen Reflect Marine and Terrestrial Components of Prehistoric Diets”, Science 220, 1381-1383. Schulting, R. J., 1998: “Slighting the sea: Stable isotope evidence for the transition to farming in northwestern Europe”, Documenta Praehistorica 25, 203-218.
van Klinken, G. J., 1999: “Bone Collagen Quality Indicators for Palaeodietary and Radiocarbon Measurements”, Journal of Archaeological Science 26, 687-695. 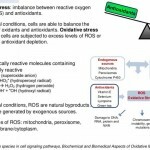 Role of reactive oxygen species in cell signalling pathways.